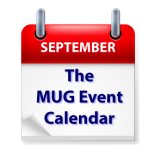 Aaron Davis of Apple leads the parade of topics on this week’s MUG Event Calendar. He will be making an appearance at a Virginia group to talk about all the new goodies from Apple. Christian Pickman of TechTool Pro will visit one California group, and Mac Family Tree will be the topic of discussion at another California group.